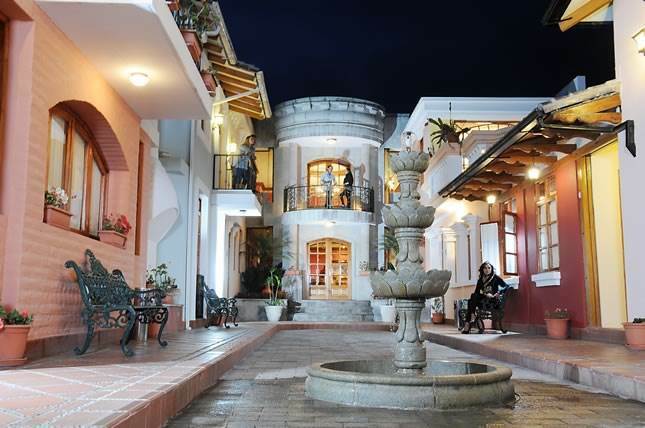 When guests arrive at charming first class four star Rincon de Puembo Hotel, they can rest, relax, and taste the most exquisite local and international food, all the while enjoying the ambience and informal atmosphere surrounded by gardens and water fountains. The hotel is conveniently located about five miles from Mariscal Sucre International Airport and is the perfect arrival or departure point when visiting Ecuador. Hotel services include Las Cupulas Restaurant, El Grill Bar and Restaurant, heated pool, sauna, steam room, Jacuzzi and gym. All guest rooms include: King or two twin beds, cable TV, free Wi-Fi, hair dryers and irons. There are also rooms with two or three beds. The family townhouses are on two levels and feature two bedrooms, two bathrooms and a living room. One bedroom is with a king bed and the second bedroom has two twin beds. Rincon de Puembo Hotel is an ideal place to enjoy the sun, snacks, or a good charcoal grilled meal prepared in front of you, as you enjoy a delicious tropical cocktail while saying hello or goodbye to Ecuador.